Here is a photo of G-ANAF before it went in to the Coventry maintenance hangar( Image Credit Simon Westwood) used. 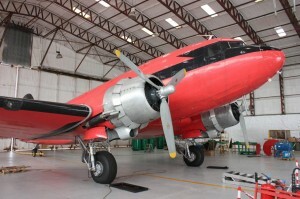 Many people outside of the UK may be unaware of Air Atlantique, which has operated a significant fleet of Douglas DC-3s in various roles for several decades now. Based at Coventry Airport in England, the fleet has splintered into several different directions in recent years, dwindling from nearly a dozen aircraft to just two active examples: C-47Bs G-ANAF and G-AMPY. This article features updates on these two aircraft. Air Atlantique’s Dakota (C-47B) G-ANAF (c/n 33436, ex 44-77104, KP220 and N107GP) has been operating for several years in a day-glo orange scheme on a lease contract with the RVL Group for marine surveillance and spraying work on behalf of the Maritime & Coastguard Agency (MCA). G-ANAF is easily recognizeable due to its huge under belly radome. Sister ship G-AMPY (in RAF Transport Command colors as KK116) has also been involved on the same lease, with some engine components from G-ANAF being used to keep G-AMPY flying whilst its sister ship was hangar-bound during the 2013/14 winter. Both aircraft (as of mid-April) are airworthy again and have resumed work under the RVL Group contract and the future of these aircraft in flying condition is secure. 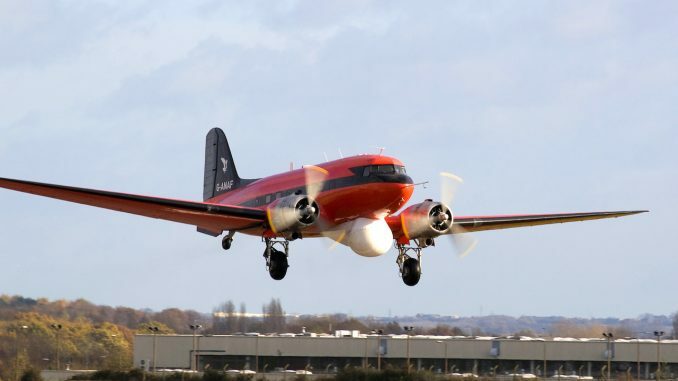 The last passenger carrying flights carried out by Air Atlantique with their Dakotas were in the summer of 2008 when G-AMPY toured many UK airports, flying enthusiast charter excursions. This ‘last’ season was due to the British CAA (Civil Aviation Authority) requiring many airframe modifications for the Daks to comply with new European ‘passenger carrying regulations’. Air Atlantique would have had to equip the aircraft with passenger oxygen systems, lockable/bullet-proof cockpit doors and escape chutes etc., which the operator considered unrealistically expensive to comply with at the time. Since then they have had discussions with the CAA for ‘exemptions’, arguing that the aircraft never fly above 5000ft on pleasure flights and that the exit door sill is only 4ft from the ground when the tail has settled after flight. The CAA has been extremely supportive of their case for a resumption in passenger carrying by Dakotas but no agreement for such flights can be made until after the present MCA contract has finished. At present the two Daks are in dispersant/spray mode, and the aircraft would have to be converted back to passenger carrying configuration before substantive discussions and agreements with the CAA could occur. There is currently no agreement in place with the CAA for these two Dakotas to resume passenger flying, either for local flights returning to the same airport, or to further afield. Economics is probably the major stumbling block to a resumption of passenger-carrying Dakota flights in the UK, and to get one or both Daks on to Air Atlantique’s AOC alone would be very expensive. In addition there is the cost of two cockpit crew plus a flight attendant, and this all conspires to determine whether it is affordable. Preliminary discussions have taken place with the newly formed Dakotair (RAF Transport Command Memorial) on whether Air Atlantique’s two airworthy Daks could join their fleet in 2015. (see WarbirdsNews article on Dakotair HERE). Dakotair currently own ex-Assault Glider Trust C-47 G-AMHJ, under restoration to airworthy condition with Weald Aviation at North Weald. No conclusion has so far been reached with these discussions. G-ANAF’s winter 2013/14 major overhaul at Coventry included removing its wings, re-stitching the fabric-covered ailerons, and fuel tank removal and refurbishment. 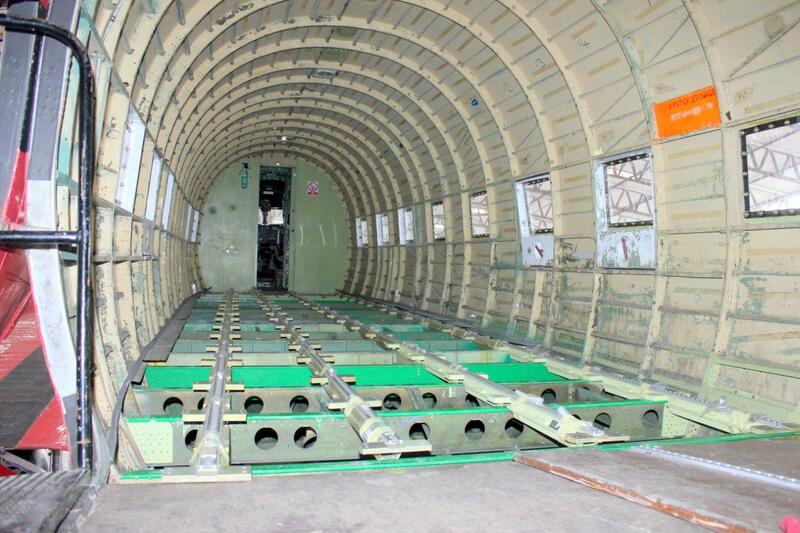 Fuselage corrosion surfaced in a few locations so the overhaul team removed the floor and attended to it. They then installed a replacement floor and new seat-runners. Classic Flight Services removed and overhauled the main undercarriage, and fitted new tires. Both propellers have undergone AD (airworthiness directive) related work. The result is that by April 2014 G-ANAF is better than new, and has flown from Coventry to be seen in British skies again during 2014. 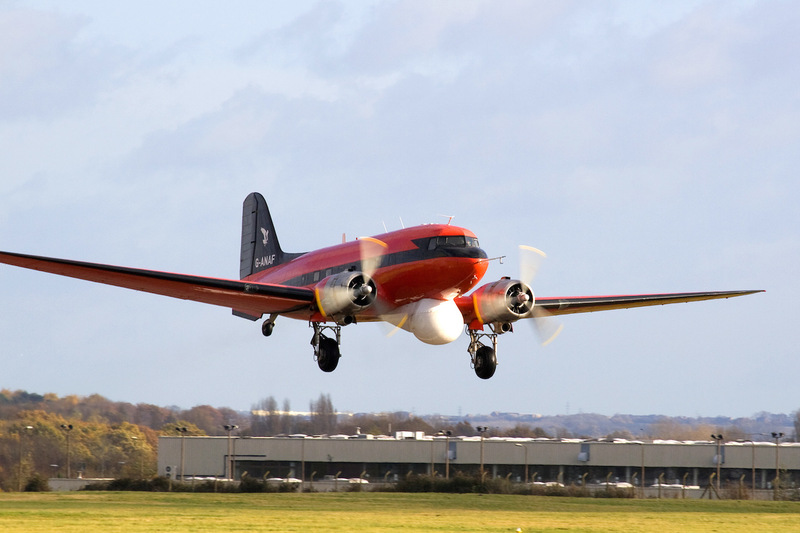 Air Atlantique are in continuous dialogue with the CAA and are not ruling out authority to fly the Dak on enthusiast flights again, but this won’t occur until 2015 at the earliest. The decision on pleasure flying will be based purely on economics of course. If a sponsor or benefactor wished to come forward to assist in this process, then Air Atlantique and Air Base would be extremely pleased to discuss ‘terms’. Great article and pictures, I love this colour scheme and also the others carried by their C-47’s with stripes accross the front fuselage. Hi im a big dc3 fan great to see these aircraft restored and im hoping to get a trip on one some day great aircraft. took us to Southend Airport for a lovely day visit and stopover. hope we can look forward to a flying programme being offered. We all felt perfectly safe flying with Air Atlantique and we were all well looked after the whole time, very much appreciated. We would all love to fly with you again …. in 2016 if possible. Yep flew on one of the last passenger flights with you in 2008 along the north cornish coast. Wonderful trip and would fly again if she comes back into service. I used to fly in them on the jump seat to the isles of mann and back when it was based in Blackpool in the 80s took some great pics of it landing. My father, Jack Hopkins, used to fly for Air Atlantique; a very familiar name to me! I chartered one of the DC3’s in 2008 for a party of 35+ which took us over the channel, along the Normandy coast taking in all the WW2 spots, returning over the White Cliff’s to Biggin Hill to refuel, then up the River Thames to the Houses of Parliament and back to Coventry. One of the very best and most memorable trips of my life. Would love to repeat it and have at least enough interest to fill two planes. I flew many times on AMPZ with one particular flight especially in mind. We flew to an air show in Germany through a terrible storm when Capt. Dixon, in the cabin, could not regain the cockpit owing to the bumps. F.O Griffin did a wonderful job with the iced up air frame and young hosti Garbut being bounced about. A great day aeroplane and crew. Thank you. I flew on G-AMPY on the ‘farewell tour’ 20th June 2008 from Liverpool John Lennon airport, what a wonderful flight down the Mersey and over South Lancashire, I am actually wearing the Classic Flight farewell tour T shirt as I type this item , talk about co-incidence ! !